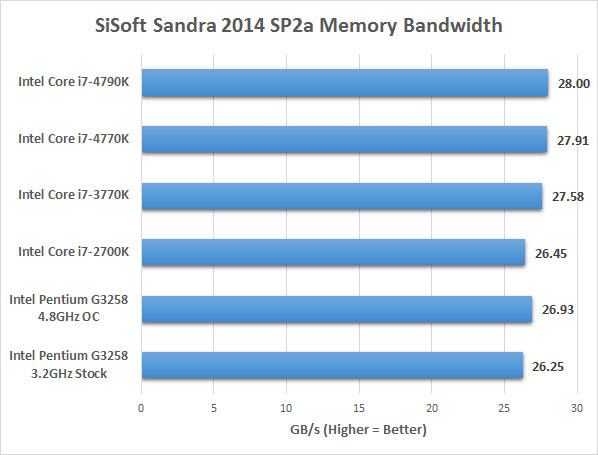 The Sisoft Sandra 2014 SP2a benchmark utility measures pretty much all of your system components, but we’ll be using it to focus on memory and CPU performance! Results: As you can see from our memory testing that was completed with a Corsair 2133MHz DDR3 memory kit, all the processors perform roughly the same. The Intel Pentium G3258 was the slowest of the group, but we did see a slight memory bandwidth improvement when the processor was overclocked up to 4.8GHz. Results: The Intel Pentium G3258 doesn’t support the Intel AVX, AVX2 or TSX-NI instruction set, so the performance was notably lower than the other processors that do. 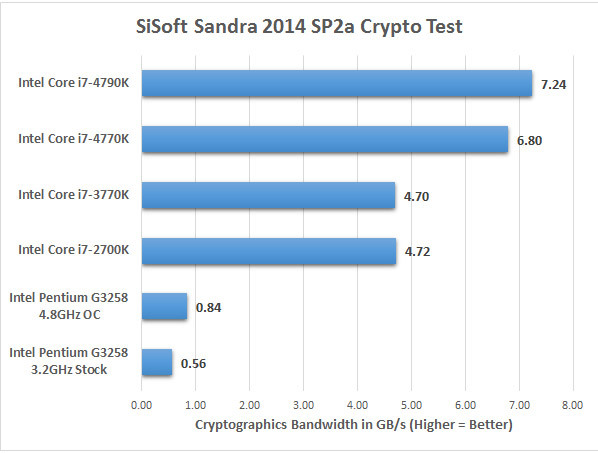 Still, The Intel Pentium G3258 processor scored 44.23 MPixels/s in stock form and that jumped up by 51% to 66.81 MPixels/s when overclocked to the max. 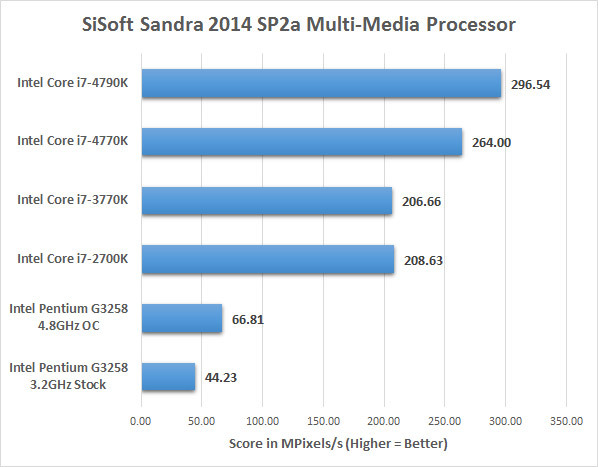 Results: All the new mainstream and high-end desktop processors support AES-NI, but not the Intel Pentium series. The Intel Pentium G3258 scored 0.56 GB/s for this AES benchmark test, which is significantly lower than other high-end unlocked K-series processors that are also in the performance charts. The good news is that the Intel Pentium G3258 costs $60 whereas the other processors cost upwards of $280. 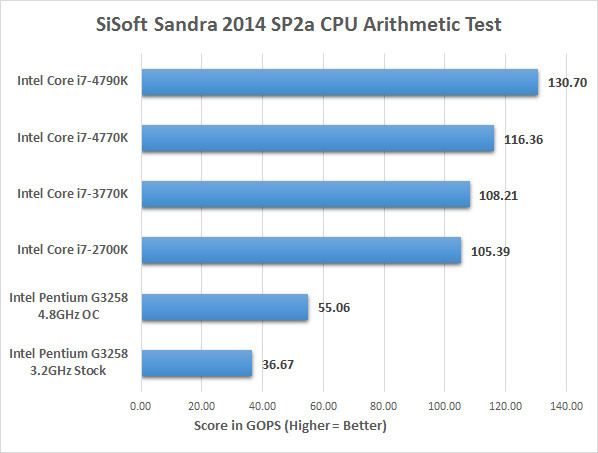 Results: In the Sandra 2014 SP2a CPU Arithmetic Benchmark the Intel Pentium G3258 scored 36.67 GOPS, but when overclocked we were able to get 55.06 GOPS. 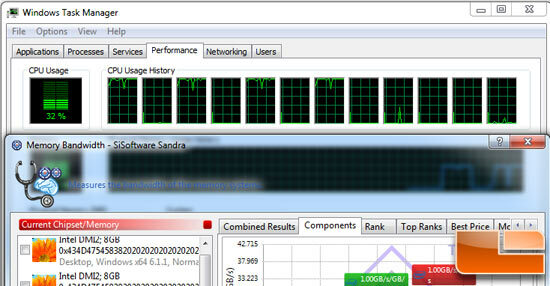 This is an improvement of 50% from a 50% overclock, so we are seeing 1:1 performance gains with the overclock so far!